Kitty Hayes is among that band of marvellous women singers and musicians whose talents lay dormant for most of their lives while they married, raised a family and worked on the farm. Related by marriage to both Tom Lenihan and legendary Sligo fiddle player, Paddy Killoran, she comes from a solid musical background. 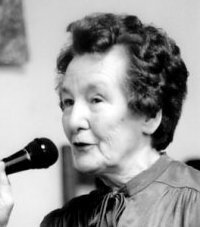 As a youngster, she sang and played concertina in her home place of Fahanlunaghta, between Miltown Malbay and Ennistymon. In 1948, she married Josie Hayes, one of the resident musicians who played at Gleeson's bar in Coore, with Junior Crehan, Paddy Galvin, Michael Downes, etc, and who kept the music and dancing alive in the area. Kitty's concertina playing and singing took a back seat for a good many years but, after Josie's death and the family grown up, she blossomed once more and is now in great demand to sing and play in the locality at sessions, festivals and at The Willie Clancy Summer School. In 2007 A Touch of Clare, a CD mainly of her concertina playing, with just one song, was issued locally.